On Friday, August 18th, the House of Representatives reviewed the Auditor General’s report on the Government of Belize’s (GOB) April 2012/ March 2013 Financial Statement. The Financial Statement in question was for the first year of Prime Minister Dean Barrow’s and the United Democratic Party’s (UDP) second consecutive term in office. While ministerial comments on the report are yet to be released, an initial review of the document by the Belizean media quotes the Auditor General as claiming ‘mismanaged accounts’. 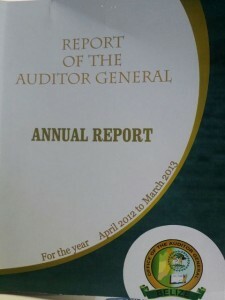 A statement within the Auditor General’s report indicated “in the analysis of Financial Statement 2012/2013 most bank accounts along with other Government of Belize accounts managed by the Accountant General were not reconciled. These accounts have not been reconciled for a number of years. In some instances, accounts have significant discrepancies, and in all instances, have a material effect on the overall presentation of the Financial Statements.” The report also indicates large payments totaling over a hundred thousand dollars issued for “financial assistance, donations, stipend, assisting with Christmas tournament, purchasing of football gear…” which aren’t not properly accounted for. Other infractions analyzed in the report include the purchase of goods at exorbitantly high market prices by the Ministry of Works, which the Auditor General comments as “blatant disregard for the appropriation of law and other regulations”. Also noted was the issuing of tertiary financial assistance grants by the Ministry of Education without proper documentation from the person the monies were awarded too. The last Auditor General’s report was on the Immigration Department, which was reviewed on August 27, 2016. This report brought to light high levels of corruption involving elected officials. A Senate Select Special Committee was formed in order to properly investigate the findings. Up to date, the hearings are still ongoing.